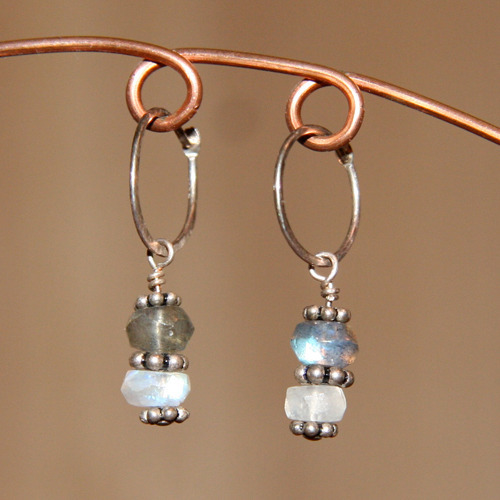 Labradorite and rainbow moonstone, surrounded by silver granulation beads dangle from tiny, hammered, sterling-silver hoops. Labradorite is a beautiful smokey-gray gemstone with flashes of blue-green. Rainbow moonstone is a white gemstone with a similar iridescent quality so they complement each other beautifully. The earrings measure 1 inch from top of hoop to bottom of dangle. .......................................... Labradorite is said to banish fears and insecurities and strengthens faith in the self and trust in the universe. It calms an overactive mind and energizes the imagination, bringing up new ideas. Traditionally, labradorite is thought to bring good luck. Rainbow Moonstone, aligned with the energies of the Goddess, can be used to enhance intuition and psychic awareness. It is thought to be balancing, introspective, reflective and promotes emotional well being joy. It is also associated with creativity and good fortune. .......................................... These earrings are hand-made to order. Slight variations are the nature of handmade jewelry and make each piece special. They will be shipped with a complimentary organza gift bag. If you prefer a gift box, please specify in the Notes box at checkout. If you are purchasing a gift that you would like shipped directly to the recipient, I am happy to include a personal message from you. In the Notes box of the order form, mention "giftshipper" and include the text of your note.